I went to the Spam Museum in Austin, Minneapolis and came home with these. Adorable, aren’t they? 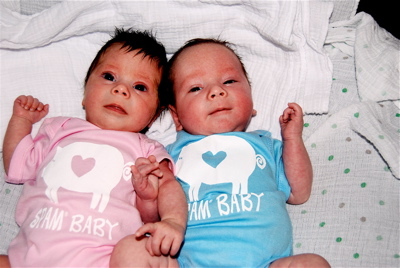 I couldn’t resist getting these Spam Baby outfits for the most recent additions to our family. Meet my great-niece and great-nephew: Annabelle and Logan Tanaka. Their daddy was raised in Hawaii and loves Spam. Loves it. So I couldn’t resist the outfits. Babies…and sometimes Spam…make me happy. Yup, I developed a slight addiction to Spam musubi when I worked at the Honolulu Star-Bulletin. A tiny retiree/vendor with a rickety table inside the back door of the building sold them, all warm and Teriyaki-ishly aromatic. For those who aren’t familiar with Spam musubi, it’s a riff on sushi. S-musubi is a savory mini-meal made up of rice formed in a rectangular block, topped with a slice o’ sauteed Spam, and held together snugly with a strip of nori (aka seaweed). Irresistible, right? I also have occasional cravings for Hawaii. Especially now, when I hear forecasts of a bitter Iowa winter. I think that’s why I took a little detour when I saw a billboard for the Spam Museum. I was on my way to the annual Seed Savers Exchange Conference, an organization that saves and shares heirloom seeds. It’s so not Spam. But I couldn’t resist the call of the Spam Museum. It’s a shrine to Hawaii’s “steak” in a can. In the Midwest. 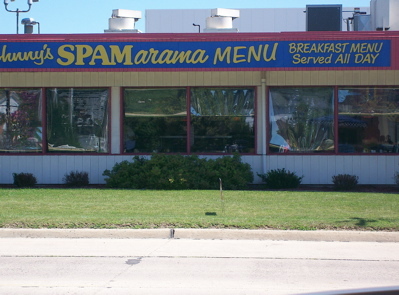 (In case you didn’t know, Hawaii leads the country in Spam consumption.) The museum traces Spam back to, I don’t know, the paleolithic era when Spam was discovered. 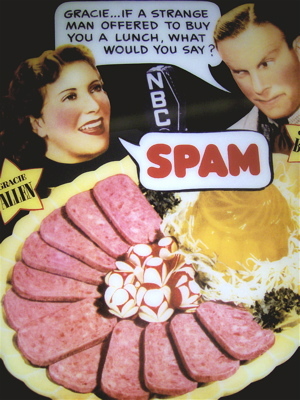 Posters track the evolution of Spam and include this one of Gracie Allen and George Burns. Yum. Spam and radishes and a Jell-O mold. You can bet that’ll be on my next party menu. 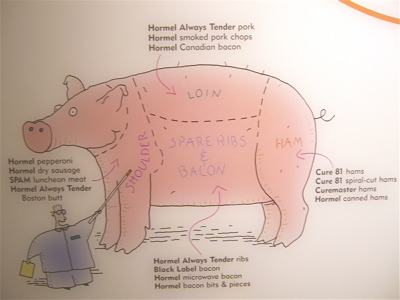 The museum also had hands-on activities (how fast can you fill a can of Spam, label it, and get the lid on? ), lots of audio-visual tours, and some fun informational displays. Like this one. I took it all in. And, after watching a movie about the history of Spam, touring the Hormel products exhibits, taking the Spam trivia contest (I rocked), and having my picture taken with a giant can of Spam, I was hungry. Starving, actually. And across the street stood Johnny’s SPAMarama Restaurant. Eureka. I was ushered to a booth and given a menu, completely Spamless. Apparently the waitress sized me up and pegged me for a non-Spam lover. So wrong. I convinced her I wanted to see the Spam menu. I ordered the Spam burger. 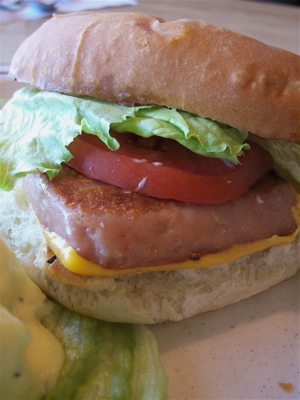 A sizzling thick slab of Spam, a slice of cheese product, iceberg lettuce, tomato, and mayo on a bun. Be still my heart. Spam. All pink and irresistible. Kinda like little Spam babies. I could use a dose of either one these days. What’s your crazy craving or food addiction that you turn to when feeling homesick or nostalgically hungry?